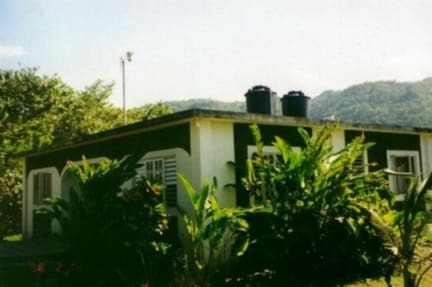 We would like to welcome you at Spring Garden Bed and Breakfast, an ECO-tourism accommodation in the Eastern part of Jamaica. We are directly located on a deserted beachfront, far away from the stressing crowds of mass tourism. Spring Garden is located in St. Margaret´s Bay, Portland, without any doubt the most lush and green Parish in Jamaica. by solarpanels and a windgenerator. In an islandwide competition for hotels and guesthouses in 1999 we won three awards, one for energy conservation, one for environmental protection and the Special Award from the then Minister of Energy, Robert Pickersgill, for outstanding achievement. Our prices do include breakfast. We serve the world famous Blue Mountain Coffee for breakfast or tea along with bread, butter and homemade jamaican jams. In addition we serve either eggs, pancakes, jamaican omelettes, ackee and saltfish, fried plantains, toasts or porridge, depending on availability! 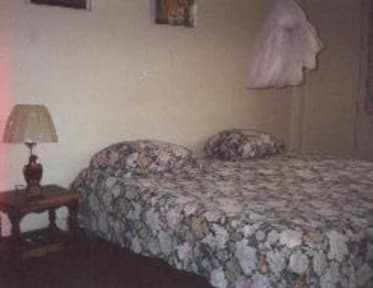 Our doublerooms have an additional single bed. If the room is occupied by three persons, the extraprice for the third person is EUR 14,- per night in addition to the total price on the confirmation. If our twin room is occupied by a single person only, there will be a discount of EUR 12,- per night from the total price on the confirmation. Please note, that we do only accept payments in house by cash. If you are a lover of unspoilt nature, Portland is the place to be, it´s also called Jamaica´s heart and soul retreat and has more ecotourism attractions than any other part of the island. There are lots of waterfalls, numerous hikingtrails and beautiful beaches. Take a trip to the Blue Mountains, a nature´s reserve where you might be lucky to see the endangered Giant Swallowtail, the largest butterfly in the Northern Hemisphere. Port Antonio itself is a tranquil town, surrounded by turquoise waters and misty mountains. Or take a tour on a bamboo raft down the Rio Grande, Jamaica`s largest river. This exciting trip was invented by the famous Errol Flynn to entertain his friends and guests on his private retreat Navy Island , which separates Port Antonio`s twin harbours. Somerset Falls are close by the guesthouse and can be reached by exciting walk along the seashore. Our tourguide Peter will be happy to take you there, he is also the guide at Somerset Falls. Shopping can be done in St. Margaret´s Bay or in the Musgrave market in Port Antonio, which features different sections for vegetables, fruits, clothing and excellent local craft works.